The Seventeenth Judicial District Commission on Judicial Performance recommends that Judge Jill-Ellyn Straus NOT BE RETAINED, by a vote of 8 to 1. Judge Straus was appointed to the District Court in April of 2008, and sworn in as a judge in July of 2008. 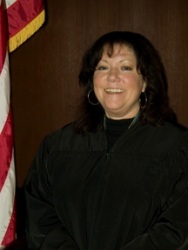 Judge Straus received her undergraduate degree from the University of Illinois in 1979. She graduated from the University of Denver, College of Law in June of 1982 and was admitted to the Bar that same year. She previously served in the Adams County District Attorney’s Office from 1983 until her retirement in May of 2008. During her time with the District Attorney she headed the Child Victim Unit and the Juvenile Division. She still maintains a passion for children’s welfare. She is the appointed State Judicial Representative to the American Bar Association, the Judicial Division’s liaison to the Criminal Justice Section and a Fellow of the American Bar Association. Judge Straus currently serves in the Juvenile Court, focusing on Dependency and Neglect cases. Over the last 6 years, Judge Straus has presided over both adult felony cases and juvenile delinquency. Judge Straus enjoys working in the Juvenile Division in large part due to her expertise with children’s legal issues. In evaluating Judge Straus, the commission reviewed surveys completed by attorneys and non-attorneys who appeared in front of Judge Straus, reviewed opinions issued by Judge Straus, reviewed Court of Appeals decisions on cases appealed from Judge Straus’ courtroom, and reviewed Judge Straus’ self-evaluation. Members of the commission also personally completed courtroom observation of Judge Straus. Finally, the commission interviewed Judge Straus on two occasions to discuss the evaluation process and results. As mentioned above, survey results were reviewed as part of the evaluation process. Twenty-two attorneys completed surveys. Of those attorneys, 41% recommended to retain, 50% not to retain, and 9% expressed no opinion. Of non-attorneys completing surveys, 82% recommended to retain, 12% not to retain, and 6% expressed no opinion. Of concern to the commission was Judge Straus’ evaluation results related to courtroom demeanor and communication as related by both attorneys and non-attorneys. Amongst attorneys surveyed, as compared to the average score of all District Court Judges in Colorado, Judge Straus received below average evaluations in the areas of case management, application of the law, communications, demeanor, diligence, and bias. Thirty-three non-attorneys completed the survey. Amongst non-attorneys, as compared to the average score of all District Court Judges in Colorado, Judge Straus received below average evaluations in the areas of demeanor, fairness, and communications. Amongst non-attorneys Judge Straus was evaluated higher, compared to the average score of all other District Court Judges, in the areas of diligence, application of the law, and perception of leniency or harshness. Twenty-one Appellate Judges completed surveys, asking to rate Judge Straus’ overall performance as a judge. As compared to the average score of all District Court Judges in Colorado, Judge Straus was evaluated higher than the other judges. During the interview process Judge Straus indicated a willingness to participate in a performance improvement plan. If retained, the commission recommends that Judge Straus participate in a performance plan focusing on demeanor and presentation in the courtroom. It is the Commission’s recommendation, by a vote of 8 to 1, to not retain Judge Jill-Ellyn Straus. Judge Jill-Ellyn Straus’ Response: I have been privileged to serve this community for 33 years, as a prosecutor, then as a judge. I am committed to continue honoring the rights of victims, the accused, and families who appear before me. The hundreds of decisions that I have made are based upon facts and the law. Appellate courts have consistently affirmed my decisions. Decisions about peoples’ lives are difficult to make; they disappoint some parties. I accept this responsibility, pledging to continue giving 100% in a professional and courteous manner. I am grateful for the continuing support of my colleagues, court staff, and case participants.